Show your support for breast cancer research with this pink ribbon hat. 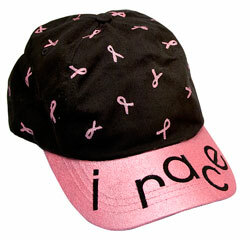 Breast cancer research supporters can wear these hats on fund-raising walks and runs. Remove any labels from surface. Use round brush and Baby Pink Deep to paint ribbon shapes over dome of cap; let dry. Adhere letters for "I race" on bill of cap, securing edges well. Use shader brush and Baby Pink Deep to paint along edge of dome on bill. Use pouncer to paint over letters and bill. Let dry. Repeat for full coverage and let dry.